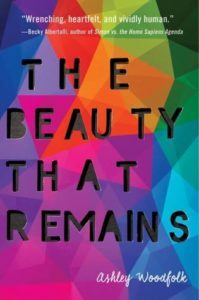 The Beauty That Remains by Ashley Woodfolk was at least partly one of those books I picked up for the cover, especially because I am rarely a fan of books that revolve around music. This quiet young adult contemporary is the story of three teens who are each grieving but connected through a band. The book alternates between the perspectives, which are all really sad because somebody close to each person has died. The book is beautifully written and the voices are distinct, but this is definitely a book about emotional journeys and so it doesn’t really feel like much happens. In combination with the fact that I was bored by all the sections revolving around bands/music, I didn’t quite connect with The Beauty That Remains the way that I wanted to. However, Woodfolks’ writing is lovely so I would definitely consider picking up her second novel, When You Were Everything, when it releases in 2019. 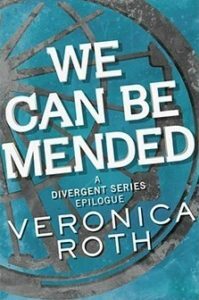 We Can Be Mended by Veronica Roth is a short story epilogue to Allegiant, and if you thought it was unnecessary, you would be right, and if you don’t understand why I read this, I don’t know either. Except the e-book was available from the library and it takes about 10 minutes to read, but those are 10 minutes that just twist the knife that was left in at the end of Allegiant in further. And further. It adds absolutely nothing to the story, and honestly, as much as I adored Divergent, after finishing this trilogy last year I am pretty unlikely to read anything else by Roth in the future. Unless it looks really good, I mean, I could change my mind, but it won’t be about this short story. 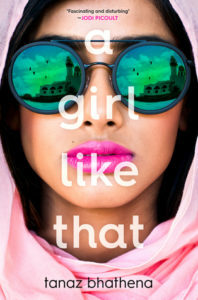 When I received a copy of A Girl Like That by Tanaz Bhathena in the mail, I decided to read it because of the author (born in Mumbai but raised in Riyadh, Jeddah and Toronto) and setting (Jeddah, Saudi Arabia). The book begins with sixteen-year-old Zarin, dead in a car crash with eighteen-year-old Porus. The story is then told through a variety of perspectives and flashbacks, leading to the moment of the characters deaths. It’s definitely one of those stories where you keep hoping for a happy ending, despite knowing from the beginning how things turned out––but not exactly why. Despite the bright and cheery looking cover, A Girl Like That is a very dark and emotional book. It deals with a lot of serious issues, and they are handled thoughtfully, but the book as a whole felt a bit scattered and just had a very difficult time keeping my attention. I ended up taking almost 2 months to read the book. That said, I really appreciated the perspective and I felt like I learned a lot about a different culture and life through Zarin’s story. 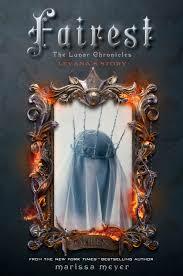 There is a lot of complexity to this story, and I really liked that Zarin was not who you might have expected. 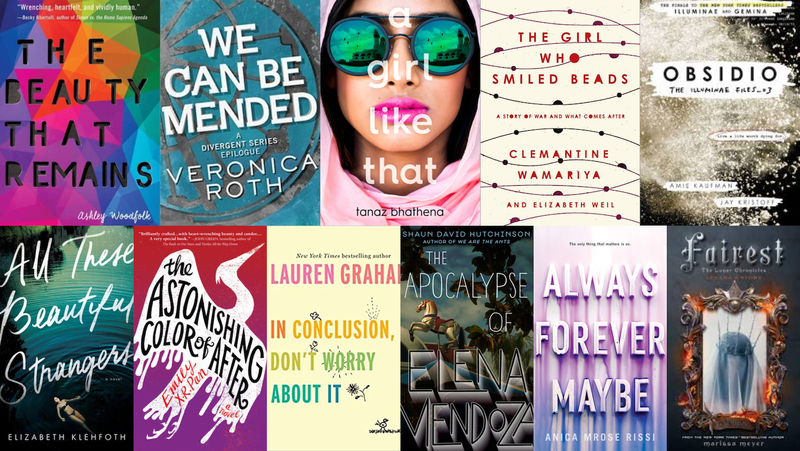 I’d definitely pick up a future book by Bhathena, whose second novel, The Beauty of the Moment, releases in 2019. 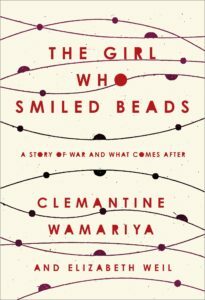 The Girl Who Smiled Beads by Clemantine Wamariya (co-written with Elizabeth Weil) is an incredible true story of survival. Wamariya was six years old when she and her older sister fled the Rwandan massacre and spent the next six years wandering through seven African countries, searching for safety, not knowing what had happened to their family, before finally being granted asylum in the United States. Rather than being a detailed non-fiction account of precisely all the events that occurred, The Girl Who Smiled Beads is a memoir about the human experience and what it was like to live through the things she did. Wamariya’s voice is so powerful, and the audiobook, which I listened to, has excellent narration by Robin Miles as well as a bonus discussion by Wamariya at the end. My only complaint was that I found the timeline difficult to follow, especially on audiobook (my hard copy has the year at the beginning of each chapter, but the audio narration did not). The Girl Who Smiled Beads is at once honest, emotional, passionate, and inspiring. Wamariya’s story will definitely stick with me. Well, it’s over. 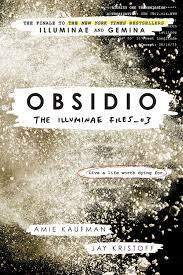 I finally read Obsidio by Amie Kaufman and Jay Kristoff, completing the Illuminae Files trilogy, which began with Illuminae (one of my favourite books of last year) and Gemina. Obsidio unites the characters of both previous books, about different teens facing attacks in space, and also introduces two new characters. I don’t want to spoil anything from the previous books by saying who these characters are, but I really enjoyed both of their perspectives. The book is also a mixed media format, a dossier of documents and chat logs and surveillance footage, which I love. I actually listened to the audiobook while reading along because the full cast audio is awesome but the visual experience of Obsidio is a must. I didn’t love Gemina quite as much as Illuminae so I was a bit nervous for Obsidio, but I shouldn’t have been. Jam-packed with action, emotion, some cheesy moments but plenty of sincere ones, it was an incredibly satisfying read and conclusion to the trilogy that did not disappoint. I’m actually just disappointed this series is over, but luckily Kaufman and Kristoff are writing another series together (Andromeda Cycle) so I definitely plan to dig into that when it is released in 2019. Over the past couple years it seems like dark thrillers have really exploded in popularity, and I can’t complain because it has definitely caused me to fall in love with the suspense genre. 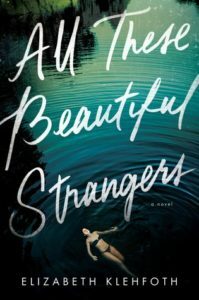 All These Beautiful Strangers by Elizabeth Klehfoth had all the makings of a successful thriller: a teenage girl from a very wealthy family attending an elite private school whose mother vanished when she was a child and who has been tapped by a secret society to join, assuming she completes several tasks in time. Reading All These Beautiful Strangers is similar to watching a show like Pretty Little Liars or Gossip Girl, you definitely have to suspend belief, but it’s still fun to enter the elite and dangerous world. I actually felt like the mystery element moved really slowly, and it was a bit of a strange blend with passages from both Charlie, the main character, and her parents. I can’t actually decide if the novel is adult fiction or young adult. I also felt like the novel, at about 450 pages, was too long and I did get impatient for action to happen. Overall, there were definitely parts of All These Beautiful Strangers I enjoyed, since it has a lot of entertaining elements, but it hasn’t done anything revolutionary for the genre. That said, I would consider reading another book by Klehfoth if the blurb sounded appealing. 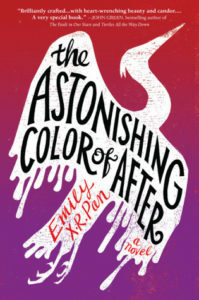 Sometimes a book unexpectedly sweeps you away, and that’s exactly what happened with The Astonishing Color of After by Emily X. Pan. Pan’s debut novel is a beautiful magical realism story about Leigh, a teenage girl who travels to Taiwan to meet her maternal grandparents for the first time after her mother dies. Leigh is certain when her mother committed suicide she turned into a bird, so now she is searching for her. She’s also ignoring the messages from her best friend, Axel, who she was kissing at the same moments her mother died. Pan’s writing is so lyrical and lovely. I listened to The Astonishing Color of After on audiobook and it was so poetic read out loud, but I think I would recommend the hard copy instead just so you can really soak up the story; I rarely reread books but this one I might consider rereading so I can experience it that way myself. The novel is packed with emotion and moves easily between the past and present. This is really a character-driven story and the characters are all complex and feel authentic. I also really loved the glimpse of Taiwan I got through the book. If you are looking for a beautiful written and heartbreaking young adult novel with magical realism elements, you definitely need to pick up The Astonishing Color of After. 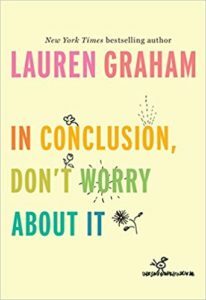 In Conclusion, Don’t Worry About It by Lauren Graham is a very short book–the print edition is 50 pages, while the audiobook (read by Graham), which I listened to is only about 30 minutes. It’s hard for a book that short to do much of anything, but in this expanded version of Graham’s 2017 commencement speech that she gave at her hometown high school, she reflects on her life and offers words of wisdom. I thought Graham’s advice was good, especially when she talks about how to measure success and finding joy. Overall, In Conclusion, Don’t Worry About It would make a nice graduation gift, but otherwise I’d just borrow it from the library when you’re in a slump and are looking for a brief inspirational read. I was a little conflicted over if I wanted to read The Apocalypse of Elena Mendoza by Shaun David Hutchinson, it had really good reviews from people whose opinion I trust but the blurb–it’s about a sixteen year old girl who is the product of a virgin birth, is spoken to by inanimate objects, and can suddenly perform miracles–did not interest me at all. After I heard the audiobook was excellent, and having a lot of time for audiobooks at the moment but not much time for hard copies, I decided to give it a try and I’m so glad I did. 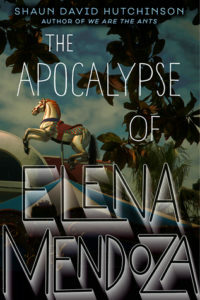 The Apocalypse of Elena Mendoza is such a weird, hilarious and heartfelt novel. It’s just as strange as the blurb sounds, and sometimes maybe a little too quirky, but also just a lot of fun while still have a serious undertone and philosophical discussions about free will. The characters are all great too, complex and authentic, and I really enjoyed Elena’s voice, including the narration by Candace Thaxton, who is excellent. My biggest disappointment was the way the ending wrapped up–it just felt a little too open-ended and not super satisfying after all the time I’d spent with the characters. That said, I’m definitely a Shaun David Hutchinson convert now, and I plan to pick up We Are The Ants sometime later this year. 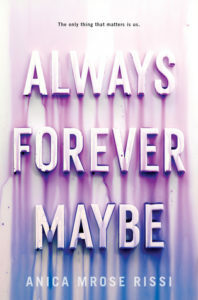 Always Forever Maybe by Anica Mrose Rissi is the very emotional story of a teenage girl, Betts, who is in her final year of high school when she meets “bad boy” Aiden at the candy store she works at. Only Aiden isn’t really bad, just misunderstood, and although the book starts off with a familiar trope, it soon veers in a different direction as Aiden becomes possessive, controlling and abusive. It isn’t easy to hear Betts’ story, because you really just want to show her how wrong things are and stop them from happening, but Rissi does a very thoughtful job tackling this dark subject. That said, I know I have to try to think of then novel from the perspective of somebody in high school, but the relationship in Always Forever Maybe was just so insta-love. If the book had taken place over a longer timeline I would have felt like the progression of events felt so much real. I do think Rissi captures well that no matter who you are, and how much your friends and family (although Betts’ mom was pretty terrible) love you, this can happen. Betts’ best friend Jo, is definitely a highlight of the book, especially given I didn’t like Betts. I was really disappointed by the ending of Always Forever Maybe which felt like it cheapened the character growth by using a dramatic event. If you are looking to read this, I do recommend the audiobook, which has excellent narration by Brittany Pressley.